NOT RUSTY! 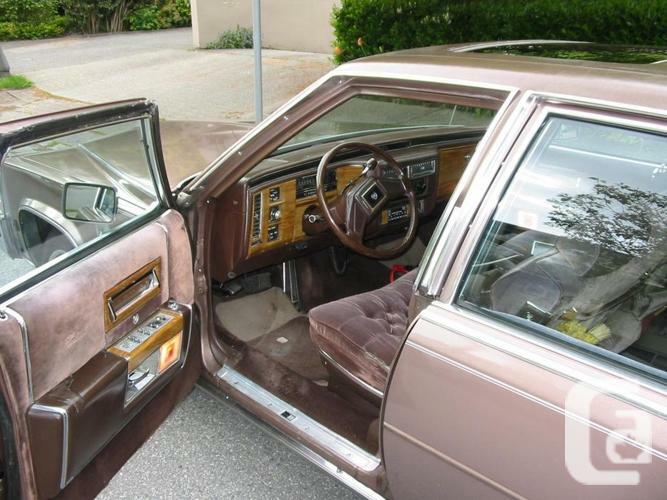 84 Cadillac, Brougham D'Elegance, Over The Past Decade, Prices For Classic Cars Have Shot Up, Out Performing Every Other Investment And Sending The Value Of The Collection Soaring. DETROIT IRON, WINTERIZED! A-1 Shape, " Air Cared" SEE BELOW FOR STATS ON LAST AIR CARE LAST FEB/14 ,Better Than New! 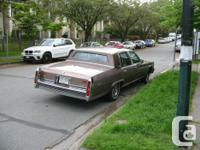 Classic, Antique, 1984 Cadillac Fleetwood Brougham D'elegance, (Kilometres 187,637 km, Total 117,000 Miles, Not Klm, Less Than 20,000 Miles On New Small Block V8 4.1 L, Cheap On Gas, Sun-roof (Tinted) Glass, 4 Door, Rwd, Rose Brown Ext, Velor Int.,Sunroof, Vinyl Roof, Original Spoke Wheels W/Anti Theft, Loaded, New Front M&S Tires+Like New Rear M+S Tires , Wheel Alignment-balanced , New Bcaa H/D Battery & Alternator, Prof. Rebuilt Air-cond., Air Module, Complete Heavy Duty Brakes New Pads & Rotors On Front, Heavy Duty Delco Air Shocks,All New Fan Belts, New Water Pump-hoses Etc, Plug In Winter, New Steering Pump, New Intermittent Windshield Wiper Module Pump & Blades, Serviced Transmission Including Fluid, (Front & Back Seals), New Oil Change For Differential, Recent Complete Tune Up Plugs, Dist'r, & New Cat. Converter,New Tail-pipe, New Starter, Oil Lube Filter Etc. Including Moly., New Gas Filter, H/D Headlights, Fog-day Lights, Special Anti-rustproofing And New Gravel Guard, Compact Spare W/ Jack, Am/Fm Tape Deck (Stereo) Front & Back Speaker System, Cb Radio N/W, Owners Manual, To Much To List, (Have All Receipts),Just Had New Oil, Lube Filter. Price: $9,999 DETROIT IRON, LIKE NEW , LESS THAN 20K MILES ON NEW SMALL BLOCK WINTERIZED!! 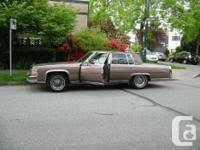 Price: $9,999 EASIER TO CRY IN A CADILLAC LESS 20K MILES ON NEW SMALL BLOCK WINTERIZED! !